Below you will find our most recent digital magazine articles. Simply click on the name of the article you wish to view from the issues displayed below. 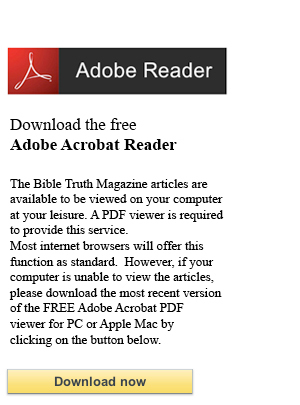 If the chosen article is not displayed you may need to download Adobe Acrobat Reader. To view articles from past issues visit the Bible Truth Magazine Archive below. 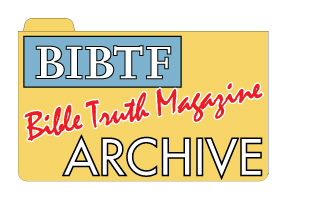 BIBLE TRUTH - the official magazine of the BIBTF - has been published, free and post free, since January 1975. Now published quarterly, in hard copy and electronic format, you are welcome to view on-screen articles and download material from past and present issues. To receive a free hard copy please use the "Contact Us" button below to E-mail us, or write to us, including your name and postal address. All available past issues of the Bible Truth Magazine are available to view by visiting the archive.